The Lessons Learnt and Reconciliation Commission (LLRC) will write to Opposition United National Party leader Ranil Wickremesinghe, inviting him to testify before it. The move comes after the commission’s secretary S.B. Atugoda telephoned Mr. Wickremesinghe to inquire whether he could arrange for a date. The LLRC is to write to Mr. Wickremesinghe next week, it is learnt. A spokesman for the commission said they were inviting Mr. Wickremesinghe so that he could provide them with the reasoning behind the signing of the Norwegian-brokered ceasefire agreement of 2002 between the Government of which he was the prime Minister and the LTTE. The commission has been tasked to examine the “facts and circumstances which led to the failure of the ceasefire agreement operationalised on February 21, 2002 and the sequence of events that followed thereafter up to May 19, 2009. The latter date is when the security forces militarily defeated the Tiger guerrillas. Besides asking him to testify before the commission on the circumstances leading to the signing of the ceasefire agreement, the commission is expected to clarify a variety of other matters. This is based on the evidence the commission has heard so far, a senior official said yesterday. The call for Mr. Wickremesinghe comes in the backdrop of an announcement by United Nations Secretary General Ban Ki-moon that a panel probing accountability issues would visit Sri Lanka. Mr. Ban said after “lengthy consultations,” President Rajapaksa had shown “flexibility” and consented to this visit. However, the Government’s official position is that the panel, like all others, would be able to make “representations” to the LLRC. This is in keeping with the Commission’s announcement that those willing to appear before it would have to write giving a brief account of what they proposed to place before the commission. However, Mr. Ban’s official spokesperson Farhan Haq said in New York on Thursday, that the panel would want to talk to others besides meeting the LLRC. In the light of this situation, diplomatic sources believe, the proposed visit by the panel may not materialise. However, the panel’s Chief of Staff Richared Bennet is expected to arrive in Sri Lanka next week. He is to be accompanied by another official assigned to the UN panel. It is not immediately clear whom the two UN officials will meet and the nature of their business. The CFA is a prominent feather in Ranil’s cap; the CFA happens to be the most forward looking initiative of the Sinhala State in responding to the nationalism of the Tamil State in recent times. It is a pity Ranil did not receive appropriate polical support in accepting the subsequent 5 year self government proposal of the Tamil State. This would have resulted in the two states growing hand in hand, socially and economically, for 5 years at the end of which a Union of the two states would have been likely. It is indeed a missed opportunity in addressing the nationalistic needs of the Tamil state as well as the Sinhala state. Ranil should be proud of his achievements and effectively articulate the reasoning behind his CFA initiative to the LLRC which will then form the foundation for a future initiative in this regard by a CBK-SF-MS triumvirate. Oheta Tawath Heena Dakinna Puluwan, Hebai Heena Negitala balanavita Duka thamai Appa. Nalla Thambi. Balanawa Indiyawa, Jatheen Kiyak innawada? Bedumakata Tenak Hamuweda? Ohela Issarawela Thamilnaduwata Wenama Rajjayak illala Balanawa, ekai mawbima. 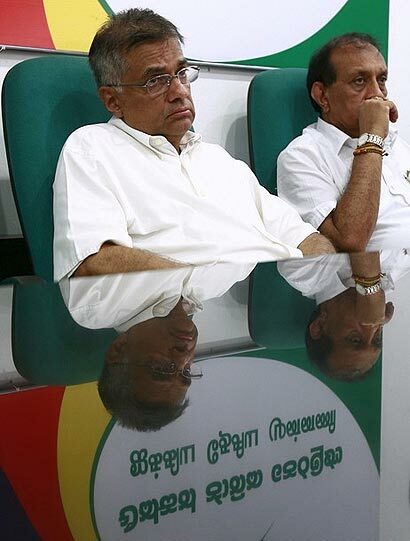 Ranil Thamange Jeevitha Arakschawata Ltte Ekkata udaw Dunnata Den Mokada welathiyenawa Appa? Nahhi Nahii. Paksche AnThima Mantrith Giyata Passe Eya Gedara yannwa. Rataka Scakthimath Vipakscayak Awascayai, Eheth Meya Vipaksce Innakan Rajaye Weradi Pennana Kawuruwath Nehe . Moda Kamata Kegahana JVP ekka Vitharai Inne. Duka Tama Appa MR Been Aye Lankawe Palanayata Enne Neha Kiyala Hitha Hadaganna Thambi. UNSG seems to be a crafty devil. He has negotiated to send 2 other high officials to SL to carry out investigations into alleged war crimes on behalf of his appointed panel,through the back door. The GOSL SHOULD NOT ISSUE VISAS TO THESE 2 MEN. UNSG has cunningly not disclosed the objectives of the visit, who they plan to meet and the purpose of the visit. Hence it is imperative of the GOSL not to grant them visas, as a responsible government. 1. For a separate kingdom for LTTE by accepting eelam. 2. Permission to import unrestricted military hardware and electronic equipment etc for the LTTE, duty free and to be delivered to the LTTE by the army, to the great humiliation and de-moralisation of the SL defence forces. 3. No travel restrictions to the LTTE in and out of the country. 4. Free hand for them build their defence fortifications and increase their military strength. 5. Sri Lankan defence forces restricted to their barracks and not allowed to increase their military strength. 6. Tiger suicide squads and killers allowed free access to any part of the country to carry out muder and mayhem to eliminate their ‘enemies’ military and political. During the 2 years RW was PM he had done much to damage the security of the nation and to increase the power of the LTTE. Hence he is now answerable to the Parliament and to the nation for his act of high treason. Let him first appear before the LLRC to provide his rationale for the betrayal of the nation. One day soon he will be rejected by his party as its leader. It will be the opportune moment then to arrest and impeach him for high treason along with the other corrupt traitors JJ, KJ, RK to name a few. DC is advocating a so-called triumvirate of CBK-SF-MS to be the leaders of the country. This is because they are weak leaders who are also corrupt traitors of the nation, who have agreed to divide the country by granting eelam to the neo-LTTE. MR is a great leader, and we need to continually back him and his brothers and son, who are rendering great service to the nation to strenegthen its security, re-build the infra-structure, and make SL the economic hub of SE Asia. However, UNP rebels and a few other Tamil and Muslim opposition parties have crept into the UPFA, seemingly to support MR, but in actual fact to bring about its destruction from within, as fifth columnists. Unfortunately, MR has failed to see the risks. The nation has given him the 2/3rd majority he asked for. So why surround himself with these fifth columnists and traitors also within his UPFA fold? Is it greed? It is these creeps who falsely advised and massaged his ego to go to UK, at such huge cost to the public purse, to give a mere speech to a University. What a debacle! It was a great humiliation for him when he had to return having been denied access to address the Oxford Union at the last moment. MR had actually been lured into a trap to try to arrest him and his security chief on allegation of war crimes. The warrant was issued by a local magistrate for the arrest of security chief only, as the diaspora LTTE and their political backers in UK could not get the arrest warrant against MR in time. I cannot understand why MR accepted the false advice of the fifth columnist in his party. He is making mistake after mistake now. He should be focused on delivering the promises to the nation along the principles embedded in his Mahinda Chintanaya. He should be focussed on rural development in the first place, because they are the ones who have been neglected all along except at election time when the political goons travel the country issuing false promises to win votes. Alas I cry for my people! Whither Sri Lanka?